Are you an incurable romantic? We would love to welcome you to our enchanting beachfront settings where you can write the chapters of your own romantic story. Sunset champagne toasts. Of course. Candlelit dinners? No problem. And what could be more romantic than exchanging your wedding vows in a seaside setting? 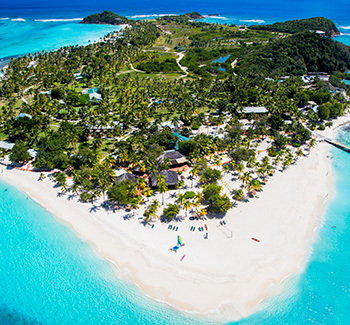 At Palm Island Resort & Spa in the Grenadines, discover romantic moments in the tropical serenity of your own private island. Fall in love with nature as you bike along scenic trails, savor a picnic lunch on a secluded beach, or enjoy a romantic dinner by candlelight, surrounded by the gentle music of ocean waves. Hidden amongst lush gardens, the Gauguin Suites at Galley Bay Resort & Spa in Antigua are ideally suited for newlyweds, offering lagoon views and concealed individual plunge pools for private dips. Romance abounds at three open-air restaurants. You can even dine in your own private cabana with flickering candlelight, just steps from the shoreline. 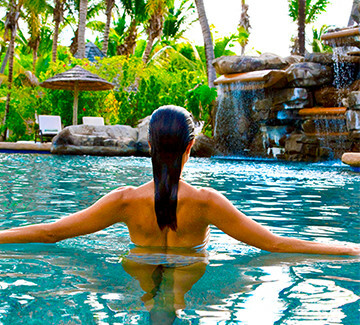 Treat yourself to an authentic Caribbean getaway at the Adults-Only Galley Bay Resort & Spa in Antigua. Set amid aquamarine seascapes, a powdery white-sand beach and lush gardens, this All-Inclusive boutique resort delights guests with a refined, yet unpretentious atmosphere. Ideal for couples and newlyweds seeking a romantic getaway, both adventure and tranquility are on the menu at this award-winning tropical paradise.